70 Year Old Steven Spielberg Releases Trailer for His Latest Movie "Ready Player One"
Featured Image by Warner Bros: OASIS is here, get ready to experience some real V.R. Get ready player one, OASIS is here. The first trailer reveal of Steven Spielberg’s “Ready Player One” was recently released at Comic-Con in San Diego. The movie is set in the year 2045 and is based on Ernest Cline's bestselling novel "Ready Player One" which was published in 2011. The movie centres around 20 year old gamer Wade Watts (Tye Sheridan) who is part of the "missing millions" and has grown up in an inhospitable apocalyptic future in which life has become so bleak and boring that most of society prefer to escape from their mundane life through a virtual reality, online world called the OASIS (Onto-logically Anthropocentric Sensory Immersive Simulation). "A world where the limits of reality are your own imagination". Wade Watts, born in the year 2025, raised in the stacks and wishing he was born in the 80's (the same era as his heroes), is taking part in an MMO virtual treasure hunt created by a Tech billionaire James Halliday (Mark Rylance), who is the founder of OASIS and has left 3 Easter eggs for the contestants to find. The reward for finding these 3 Easter eggs are complete control over the OASIS system, and Wade has found one of them. 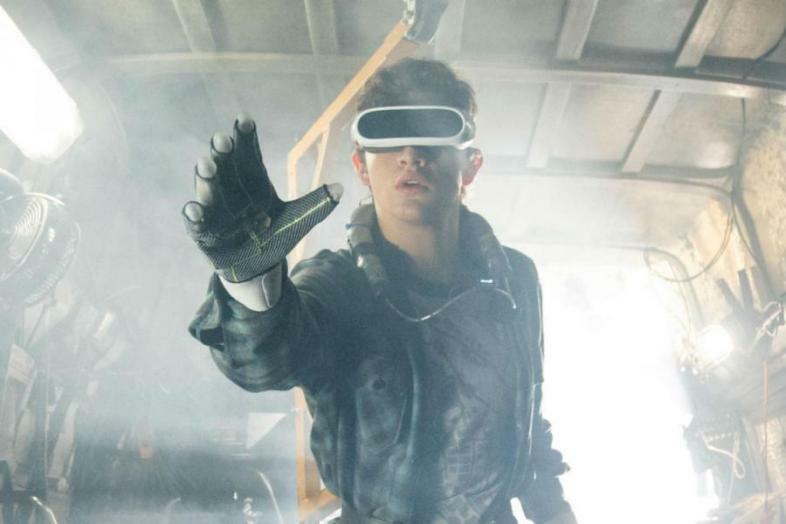 In the virtual reality world of OASIS, players can interact with characters from pop-culture, 80's Sci-fi and old-school video games such as "The Iron Giant," "Lord of the Rings," "Nightmare on Elm Street," "Akira," "Back to the Future," and "Tron" just to name a few of them. It took Spielberg and his team two and a half years to create the complex V.R world you see in the trailer. At the Comic-Con panel discussion, after Spielberg had read Ernest Cline’s best-selling novel about a society hooked on virtual reality, he said his first thought was “They’re going to need a younger director.” But he chose not to let his old age become a factor and decided to take on the best-seller. He also confirmed that "The Iron Giant is a real major player in this story". The film will star Tye Sheridan (X-Men: Apocalypse), Ben Mendelsohn (Rogue One), Mark Rylance (Dunkirk), Olivia Cooke (Bates Motel), Hannah John-Kamen (Killjoys), Simon pegg (Shaun of the Dead) and T.J. Miller (Silicon Valley, Deadpool). The movie is due for release on 30 March 2018 in the UK, US and Australia.